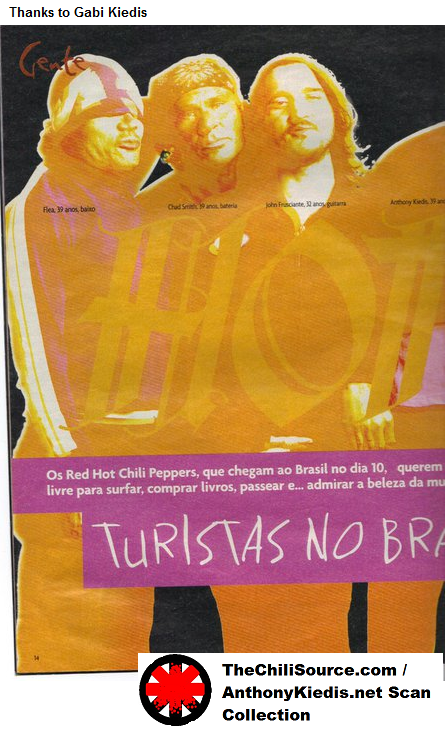 The Red Hot Chili Peppers, coming to Brazil on the next 10th, want free time to surf, buy books, wander and… admire the Brazilian woman’s beauty. 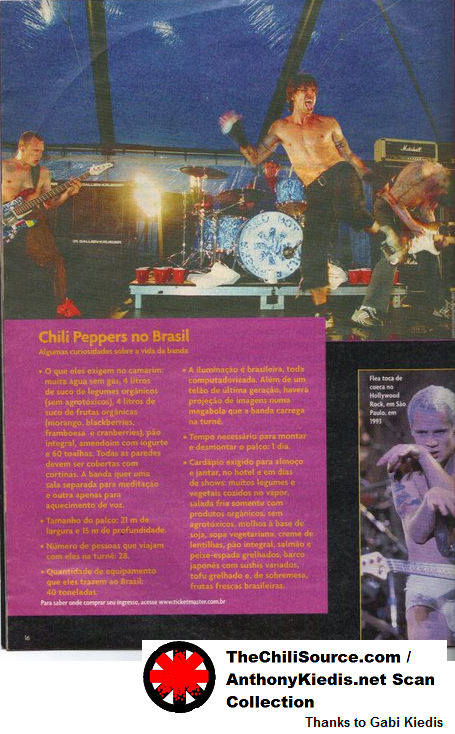 One of the Red Hot Chili Peppers’ requests for this forth coming to Brazil was not to have any work to do but the three shows, October 11th in Rio de Janeiro, 12th in São Paulo and 14th in Porto Alegre. 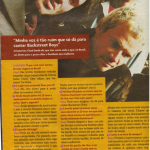 “I want free time to go surfing”, said the bassist Flea in an exclusive interview for CAPRICHO, in Los Angeles. He, the drummer Chad Smith and the singer Anthony Kiedis talked to us, in one of the Hollywood’s most traditional hotels, the Chateau Marmont. 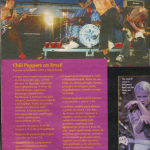 The place for the chat was chosen because it was there where the Chili Peppers recorded the vocals for their new album, By The Way. The band rented a room, took paintings, cushions and other luxuries from home and set up camp. “No one complained about the noise, we were really discreet”, Flea tells. 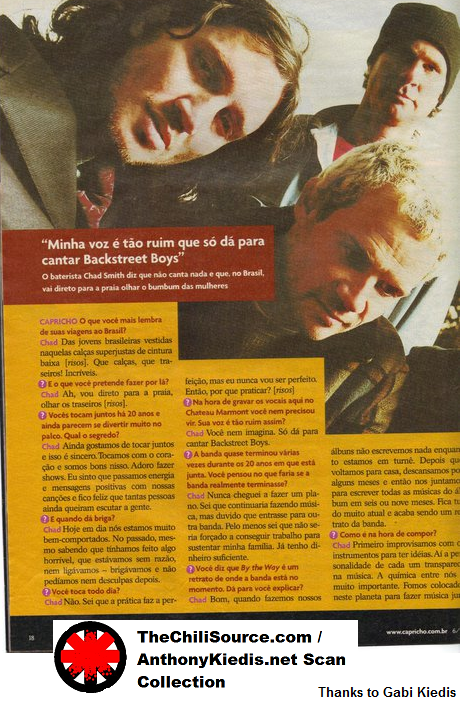 In the interview, the three of them remembered their last visits in Brazil. Flea found an Argentinean girlfriend in Buzios (RJ). Chad could only talk about the Brazilian women’s butts and low waist pants. And Anthony can’t wait to go to the beach. CAPRICHO: What do you expect from the gigs in Brazil? Anthony: I’d rather not have many expectations, because every time I do I end up getting disappointed. I try to keep my mind open for every show, every trip, and every city we visit. I will use my creativity and invent something when I get there. What’s your favorite memory of previous trips? Anthony: Favorite memory of Brazil? I loved being sitting, staring at the sea. I loved walking through the Rio favelas and going to a samba school. I loved staring at the anonymous people’s faces in the streets. And I loved seeing different races mixed in the streets. You have hardly changed in this 20-year career of the band. Do you feel like an eternal teenager? Anthony: No. But that would be a nice name for a song, don’t you think? Or for a horror movie maybe. Can you imagine? Someone being a teen for the rest of their life? Terrible! What do you think of the adolescence? Did you enjoy yours? Anthony: I love teenagers, their energy. And I loved my adolescence. But I wouldn’t like to be a teen forever. The processof maturing, changing andlearning to be responsible has been fascinating. I’m really curious about the aging process. I’m not afraid of getting old. I don’t live in this weird world which finds aging bad. In the artistic world, lots of people get scared when they realize they are getting old. I find it fun and I like to see the changes and the things I’ve learned. And it helps me keep the heart young. I feel spiritually and physically younger today than 20 years ago. · What they request in their dressing room: a lot of still water, 4 liters of organic (with no pesticide) vegetables juice, 4 liters of organic fruits juice (strawberries, blackberries, raspberries and cranberries), brown bread, peanuts with yogurt and 60 towels. All the walls must be covered with curtains. The band wants a separate room for meditation and other only for voice warming. · Size of the stage: 21 m wide 15 m depth. · Number of people who travel with them on tour: 28. · Quantity of equipment they are bringing to Brazil: 40 tons. · The lighting is Brazilian, all computed. Besides a next-generation screen, there will be images projected in a huge ball that the band carries on tour. · Required time to set the stage up and down: 1 day. · Required menu for lunch and dinner, at the hotel and on the days of show: lots of steamed vegetables, cold salad with only organic products, without pesticides, soy sauces, veggie soup, lentils cream, brown bread, grilled salmon and swordfish, Japanese sushi boats, grilled tofu and, for dessert, fresh Brazilian fruits. CAPRICHO: How is your ritual before the shows? Flea: I usually start my day doing yoga, then I go out for a walk and only then I sit down to have breakfast. Then I go back to my room and take a nap. When I wake up I do some warming with the bass so to let my fingers ready for the show. After it I meditate, say a pray, do stretching and go on to the stage. Flea: No, I’m only spiritual. My pray is a conversation with God. Flea: I was so quiet, shy, introverted and lonely. Anthony and I met when we were both 15. We’d do a thousand things together. We’d climb mountains, swim, and hitch a ride to San Francisco. Everything was intense, including drugs. I always wanted to try everything. Many things were dangerous and destructive, other were healthy and amazing. Looking back, there are a lot of things I’d rather not have done. But I didn’t know by then. Didn’t your parents try to stop you? Flea: I come from a very crazy family. Since I was 15 I went out every night and I was on the street until 4 in the morning. Even if they said anything, I didn’t care. Today you have a 14-year-old daughter, Clara. How do you deal with her? 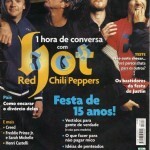 Flea: She is in a very different situation than I was when I was her age. She’s very focused and lives a way more comfortable life. Do you talk about the crazy things you did? Flea: Yes. She knows everything about me, I don’t hide anything. We talk about everything, expect about her affairs and little boyfriends. I would like to talk about boys too, but she prohibits the issue. Do you think your daughter is ashamed of you sometimes? Flea: Yes. She thinks I’m an idiot [laughs]. She hates me when I appear in front of her friends’ parents with my hair dyed orange, for example. What do you think of antidrug campaigns? Flea: The smartest thing somebody’s ever told me about drugs came from a 70-and-something years old guy who saw me at a bus stop when I was 13. He told me not to put anything in my body that wasn’t healthy, because that would complicate me when I was older, and it wouldn’t worth it. When you get old, you want your brain to work properly. I didn’t realize it by then, I thought I was going to die before I was 30. But today I think that the most beautiful thing somebody can do is to get old gracefully and lucid. Using drugs brought me a lot of problems, it wasn’t really worth it. The benefit you get when you get high you can get from some other things. You can get high with yoga, for example. The album By The Way is very melodic, less aggressive than your previous works. Could it be that you are getting calmer? Flea: I don’t know what’s happening to us, but I don’t feel like we’re getting calmer. And I don’t think our music is less intense. In fact, I think it’s deeper. What do you think of the new rock bands like Creed, Linkin Park and The Calling? Flea: I have nothing to say about those bands, honestly. Would you like to be like the Rolling Stones one day, who have gone past 60 and still tour? 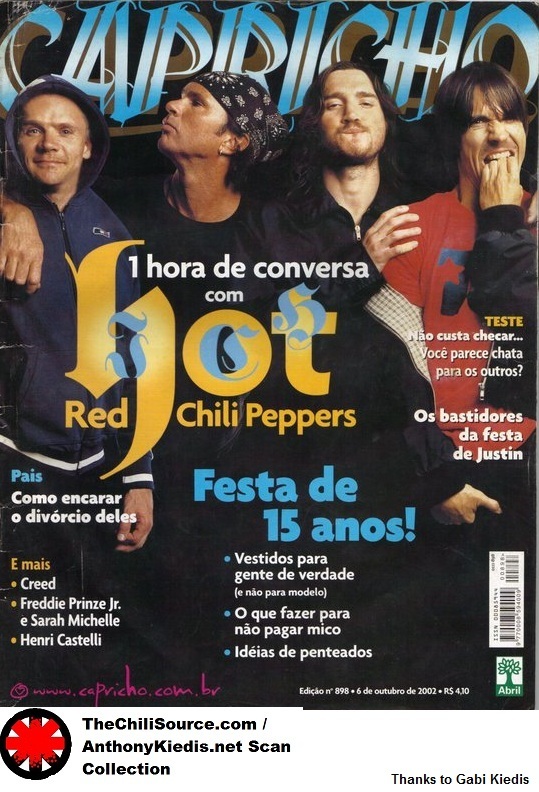 Flea: Ok, after we play in Brazil [laughs]. What are the best memories you have of Brazil? Flea: I have two great memories. The first one was playing with Nirvana. 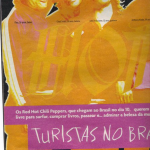 I loved Nirvana and I played trumpet with them in 1993, in Rio. Another good memory is from Búzios, where I met an Argentinean girl who I really fancied. I should have married her. Flea: That’s right. She was amazing. She played piano. Once in a while we still talk. She has a son today. I hope she’s alright. Besides having met that woman, I found Brazil phenomenal. CAPRICHO: What do you remember of your trips to Brazil the most? Chad: The Brazilian young girls wearing those super tight low waist pants [laughs]. What pants, what arses! Amazing. And that do you intent to do there? Chad: Ah, I’m going straight o the beach, look at the arses [laughs]. You guys play together for 20 years and you still seem to have so much fun on stage. What’s the secret? Chad: We still enjoy playing together and this is sincere. We play with our heart and we’re good at it. I love performing. I feel that we send energy and positive messages with our songs and I’m so happy that so many people still want to listen to us. And what about there’s a fight? Chad: We are quite well-behaved nowadays. In the past, even knowing we had done something horrible, that we had no sense, we didn’t care – we fought and we didn’t even apologize afterwards. Do you play every day? When time came to record the vocals here at the Chateau Marmont, you didn’t even need to come. Is your voice that bad? Chad: You have no idea. I can only sing Backstreet Boys. The band almost finished several times during the 20 years you are together. Did you ever think about what you would do if the band really broke up? Chad: I never managed to make a plan. I know I’d keep on making music, but I doubt I would join another band. At least I know I wouldn’t be forced to get a job to support my family. I’ve got money enough. You say that By The Way is a portrait of where the band is at the moment. Can you explain? Chad: Well, when we make our albums, we don’t write anything while we’re on tour. After we get back home, we rest for a few months and then we get back together to write all the album songs in six or nine months. Everything is pretty fresh and it ends up being the band portrait. What is it like in the writing time? Chad: First we improvise with the instruments to have ideas. Then each of our personalities shows itself in the song. The chemistry among us is very important. We were put on this planet to make music together. And we respect it. Do you think that the fact that John, Anthony and Flea stopped using drugs helps the atmosphere? Chad: I think so. Everyone is in the same emotional level now, no one is worked up. And there’s a certain great energy that flows when everyone’s sober. At the moment, it works. Everyone gets along well. Chad: Manon is 6 years old, Justin is 5 and Eva is 19 months old. When they grow up, will you ask them to stay away from drugs? Chad: I want to give them some good advice and good values. We live in Hollywood, with a thousand temptations. The more I forbid, the more they will feel like using drugs. So I guess it’s better to tell them about the danger, explain to them it’s not nice and hope that they will respect themselves. Will they go to Brazil with you? Chad: No. But they’ve been in Europe recently. One month before the 9/11 terrorist attacks you guys cancelled a show in Israel for safety reasons. Did the decision come from you? Chad: I was the most concerned. I didn’t want to go because of the civil war, which was getting worse already. Despite of knowing it would be nice for the fans to see us, I didn’t want to create a situation in which something bad could happen. We will go there in another time. Did the chemistry in the band get better with John Frusciante’s return? Chad: It certainly did. He’s the core of so many songs – he writes plays and now he does the backing vocals in several of them. He has an amazing voice.